3 hours drive north of Auckland you’ll find Whangarei, New Zealand’s northernmost city and an increasingly popular destination to visit. There are a great number and variety of things to do in Whangarei and we’ve handpicked 11 of our favourites to give you a taste of what there is on offer! We begin with an awesome down-under experience (literally) at the Abbey Caves Reserve, less than 10 mins drive from the heart of Whangarei. The Abbey Caves Reserve is an amazing natural mix of native bush and limestone rocks as well as the magnificent caves themselves. The walking paths take you to the three main caves, nicely named Organ, Middle and Ivy. Visitors love the glowworms and a few have even spotted eels and freshwater crayfish too. Just make sure you go prepared (headlamps/footwear) if you’re going to delve deep! The caves aren’t the only bit of adventuring you can do in Whangarei as is proven by the Adventure Forest! The Adventure Forest is a place to face treetop challenges which includes the likes of obstacles and ziplining. There are 12 courses in total with different levels of activity for people of all ages. It’s a great one for kids and adults and a good confidence builder too (should you need it)! The AH Reed Kauri Park is a wonderful opportunity to see one of the most magnificent species of native trees in New Zealand. The mighty Kauri. The Kauri here are around 500 years old and stand as high as 23 metres. There are a number of walks you can do, including canopy walks, so you can see them in their full glory. The streams, waterfalls and birdlife make it all the more magical. Some of the most extraordinary coastlines in New Zealand can be observed from Whangarei by visiting the Bream Head Scenic Reserve. The view of the area from afar is spectacular with its dramatic ridgeline and it’s just as breathtaking up close. It’s interesting from a historical point of view as well as an area that was previously occupied by Maori, the remnants of which you can still see today. The 3 walks range from 90 minutes – 6 hours suiting different levels of physical exertion. New Zealand is spoilt with a good number of fantastic specialist museums and Whangarei has an awesome one in Claphams National Clock Museum. The museum showcases over 2,000 clocks and timepieces, a collection that was started by a Mr. Archibald Clapham in the early 1900’s. There’s a huge variety of quirky and unique clocks, unlike any you would’ve seen anywhere in the world. The experience is as informative as it is fun! If you’re planning a trip to New Zealand you got to include some Kiwis and there’s no better place to see some than Kiwi North! Kiwi North allows you to witness Kiwi (as well as other native species) in a controlled natural environment. The feeding times at 11am, 1pm and 3pm are a real treat if you can get your timings right. They also regularly feature local exhibitions too. The other great thing about Kiwi North is that it is a GO Rentals GO Play Partner which means our customers get a 10% discount!!! For a great workout and an even greater view, you can’t go past the Mount Manaia Track. The summit of Mount Manaia is some 420 metres above sea level which is the objective you’ll be aiming for. In return, you’ll have the pleasure of one of the most amazing harbour entrances to be seen. There are 1,000 odd steps to negotiate but people overwhelmingly say it’s “well worth the effort” and we agree! Another great little museum (which actually isn’t that little) is the Packard Motor Museum featuring one of the largest collections of Packard automobiles in the world! Whangarei seems a strange place to find these iconic luxury vehicles from yesteryear but that just makes it an even more unique experience. There’s a huge range of cars, motorcycles, military vehicles and earth movers to see and admire. The guides are extremely knowledgeable and enrich the visits too. For those skilled in snorkelling and diving, you’ll probably already know about Poor Knights Island Marine Reserve, one of the best of its kind in the world. That’s not just our opinion either. The legendary Jacques Cousteau said so himself, and so have thousands since when experiencing this incredible underwater environment. Caves, tunnels, sheer cliffs, kelp forests – it has everything covered and there are a number of good local operators who will help you see it all. Everyone loves a waterfall and Whangarei Falls is one of the most picturesque and photogenic you’ll find. At 26 metres high, they certainly make for a spectacular sight and the viewing platforms both near the top and bottom make the most of its splendour. The walking paths around the Falls are very pleasant too, all the more enjoyable at sunrise or sunset. “Quarry” and “Gardens” aren’t two words that typically go hand-in-hand but Whangarei makes it so! The Whangarei Quarry Gardens are described as a subtropical oasis created by the local folk and volunteers who’ve done an exceptional job. Set across 60 acres with a lake as its focal point, the diversity and quality of the gardens are simply superb. The historical remnants of the quarry have also been preserved and the wildlife, including resident quails, are nice touches to enjoy. A great one to finish on! Plenty of things to do in Whangarei! As you can see there’s no shortage of things to do in Whangarei! We hope you’ve enjoyed our list and that you experience and discover some for yourself in this great part of the country! Explore the best of the Bay of Islands. Encounter diverse wildlife, spectacular scenery and the rich culture and history of the region. Be immersed in the story of the Bay. Power through the cavernous hole in the Rock and marvel at the impressive size of what nature has created. 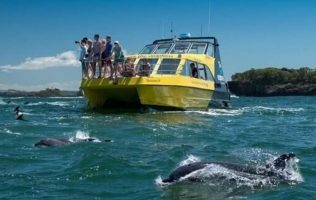 Spot dolphins frolicking in the warm waters with birdlife, seals and more. Learn about the importance of taking care of this national maritime park. "White Island Tours offers you the incredible experience of exploring the inner crater of New Zealand’s only active marine volcano – White Island! Located 49km off the coast of Whakatane, New Zealand, White Island Tours offers its visitors a 6 hour adventure to this fascinating island volcano. * Not applicable on shop & cafe."